Coast to Coast: Just how sneaky are the Utah Jazz? There is one simple step to success in the NBA: score more points than the other team. If you do that, you will more often than not come away with a victory. One team that has mastered this elusive formula of winning is the Utah Jazz. Since the All-Star break, Utah is 17-6, which is the second-best record in the league over that stretch. The Houston Rockets are first, with a 20-4 record. James Harden has pretty much mastered the whole score more points strategy. However, as usual, the pulse of the NBA is not beating strongly in the mountains of Salt Lake City. The Jazz have gone under the radar for much of the season, only appearing on national TV three times in the past two months. Still, whether battling on the highest stage or not, the Jazz are taking care of business. Before losing to the Los Angeles Lakers on Sunday, they were on a 12-1 demolition tour. Excluding the one loss between their March 13 win over the Phoenix Suns and April 5 win over the Sacramento Kings, Utah outscored opponents by an average of 19 points per game. The schedule included just one game against a playoff team, a 114-98 win over the Brooklyn Nets, but beating up on weak teams late in the season is never a bad sign. After enduring the toughest schedule in the first half of the season, the Jazz got to face an assembly line of easy competition and continued to send them packing pretty much every time. With two games to go, they sit fifth in the Western Conference, cushioned by two games on either side by the Portland Trail Blazers and Oklahoma City Thunder. Barring anything drastic, Utah should finish in the No. 5 spot for the second year in a row. And once again, also for the second year in a row, the Jazz will head into the postseason destroying teams left and right, proving to be a tough out for any organization. The main reason for that is the very effective combination of sophomore guard Donovan Mitchell and defensive superstar Rudy Gobert. After a stellar first season, Mitchell hasn’t done significantly better, but replicating one of the highest volume scoring seasons for a rookie is not a bad thing. So far in 2019, he has slightly bumped his scoring, passing, free throw rate and three-point percentage compared to his rookie year. In addition to all that minor improvement, Mitchell is something that very few young players get to be: the No. 1 option on a playoff caliber team. He’s done it for two seasons now and done it well. 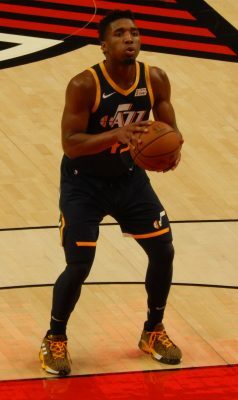 He is one of the youngest players to be leading a playoff squad, and the fact the Jazz have performed so well is a testament to his play on the court. It would be really easy to play hero ball and get shot-happy, which is something that Mitchell has a tendency to do and did a lot of early in the year, but for the most part, he is a bright offensive player. Despite getting tons of pressure and responsibility thrown onto his shoulders from his first step onto the court, Mitchell has made becoming an NBA star on the rise look easy. His starting center, Rudy Gobert, has made Mitchell and everybody else’s life on the Jazz a lot easier. There might not be a more reliable center on defense than Gobert. No one on the Jazz has to worry about letting their man drive past them because Gobert — nicknamed “Stifle Tower” with a 7-foot-9-inch wingspan — will be there to gobble up anything in sight. Gobert makes defense look easy. Just having long arms isn’t enough, you also have to know how to use them. After a few seasons of constant improvement on defense, Gobert is now a master at using the fire truck ladders most people call his arms. The only way to stop Gobert might be to remind him that he failed to make his first career All-Star game. That will make him cry, which should blur his vision, but even then, his tears might have a long enough wingspan to send that weak floater into the second row. You could even try to thwart Gobert by presenting him with his most hated enemy: a bottle of water. But even then, his defensive instincts will kick in, and he will swat the bottle back to whatever crumbling arctic glacier it sprouted from. As Gobert’s career has progressed, his value on the offensive end has only increased. This season, his 15.8 points-per-game average is a career high, and his league-leading field goal percentage — 67 percent — is also a career high. He might need to get that three-point percentage up, though. His zero percent on no attempts this season is the worst in the history of the NBA. Besides their two top guys, the Jazz are filled out by a defensively-oriented group of role players. Joe Ingles, Jae Crowder, Derrick Favors, Royce O’Neale, Thabo Sefolosha and Ekpe Udoh all have something to bring to the table. While Mitchell and Gobert might host the party and set up all the plastic silverware, the remaining Jazz players have the ability to make a nice potluck dinner. When the playoffs come, no one will want to face the Jazz. Playing in one of the loudest arenas in the NBA, Utah will never let an opposing team escape with an easy win. I think this article would be more fitting for the University of Utah than Boston University.